The Feast of St. Louise de Marillac, is being celebrated at the Miraculous Medal Shrine on March 15th all day and in a very special 12:05pm Mass being celebrated by His Excellency, Bishop Timothy C. Senior. St. Louise de Marillac is famous for her Charity and work with St. Vincent de Paul and the poor. She is well known for being the co-foundress of the Daughters of Charity, who are now 23,000 in number and serving in 150 countries around the world, working to better the lives of the poor daily. The Miraculous Medal Shrine will be collecting canned goods, food and donations for the poor that the Daughters of Charity and Priests and Brothers of St. Vincent de Paul work with here in Philadelphia. These donations can be brought to the Shrine during the 3 Day Novenas leading up to the Monday Feast Day in March 15th. “We are humbled to remember such an important woman and her work here at the Shrine on her Feast day and all throughout the year. It is an honor to have Bishop Senior here to mark this celebration in such a special way,” says Rev. Carl L. Pieber, C.M., Executive Director of the Miraculous Medal Shrine. 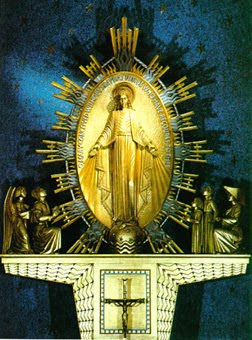 Miraculous Medal Shrine, 500 E. Chelten Ave., Phila, PA 19144 – 215-848-1010.